Europe gets its own Vegas! Giant casino complex the size of 750 football pitches to be built in suburbs of Madrid. The £19billion resort will include 12 hotels, six casinos and three golf courses. Behind the operation is billionaire owner of the Venetian in Las Vegas. The gigantic complex will be completed within the next 18 years and create 260.000 new jobs. The group reacted to yesterday’s announcement by saying Las Vegas Sands wanted to create an ‘island’ for gambling and will count on specially granted tax breaks and the relaxation of laws regulating smoking bans. Critics have said the project will promote unwanted activities such as prostitution and will only create ‘low level’ jobs such as posts for card dealers, waiters and chamber maids. I say: Bring it on! This entry was posted in Spain on 2013/02/09 by Trailsurfer. When I was strolling around in Madrid looking at the must-see-tourists sights I stumbled across this cute old couple singing passionate songs to the passing audience. Check out the video below to listen to their music. On the streets of Madrid this old couple captured the audience. This entry was posted in Spain on 2013/01/13 by Trailsurfer. On one of the many side streets to the busy Gran Via, in Madrid, I found a wonderful little family owned restaurant named Abrasador. The free range beef and pork served in Abrasador restaurant comes directly from their farm in Toledan village of Menasalbas which they have run for the last 30 years. By owning their farm and its livestock the family can control each phase of the meat process – straight from the farm to my plate. They claim to guarantee “quality and confidence” and they surely live up to this statement. Julio is one of the proud owners of Abrassador. The charming seating of the restaurant. It feels “spanish”. Selection of meat behind the counter in the restaurant. I ordered beef with potato and egg. My bill, including a Coke, came only to 12 Euro which is a steal in Madrid as most restaurants around the Tourist areas tend to be more pricey. I am going back tomorrow for my second dinner. I went to Abrasador Restaurant opposite Hotel Best Western Arosa on Calle Salud. If you want to eat at Abrasador then check out their web page here. Check this ad out from Hotels.com where the guy is booking a room using their Ap while running from the bulls. This entry was posted in Spain on 2012/08/20 by Trailsurfer. The public sector in Spain has been slammed for reckless public spending which is contributing to the country’s financial woes after it emerged up to 30 of the 47 state-run airports only deal with as few as 100,000 passengers per year. One airport – Badajoz, near the Portuguese border – saw its last commercial flight take off in January. So if you are going to Spain make sure that there is an airport to arrive to since there will be airport-closing-season for Spain this year. This entry was posted in Spain on 2012/05/26 by Trailsurfer. 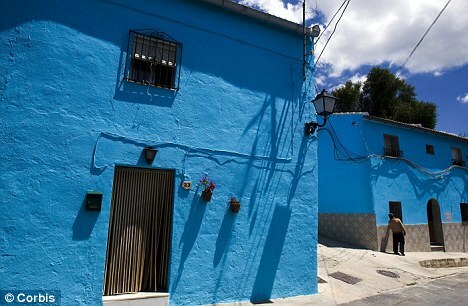 The producers of the film The Smurfs picked the tiny village of Juzcar, near Malaga, as a publicity stunt and painted every building blue ahead of its release. The mayor is now asking residents in a referendum if they want to keep the change, after its has become an unexpected tourism hit. It took a dozen painters 1,000 gallons of paint to transform Juzcar into a place that the Smurfs would feel at home in. Sony promised it would restore the town’s buildings to their brilliant white after the premier party in July. This entry was posted in Spain on 2011/10/01 by Trailsurfer. 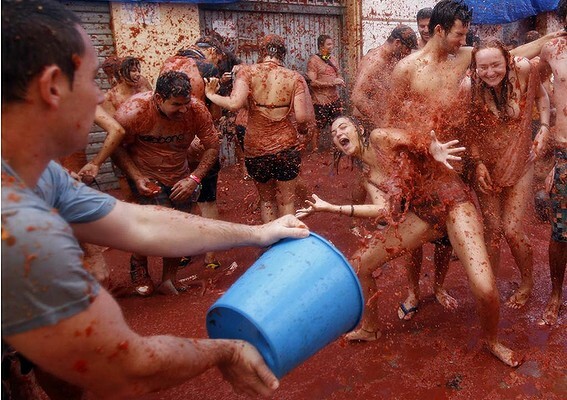 Tens of thousands of revellers splattered each other with 120 tonnes of squashed tomatoes yesterday in a gigantic annual food fight known in Spain as the Tomatina. The streets ran red with slippery juice as nearly 40,000 people, many stripped to the waist and drunk with sangria, pelted each other in the Plaza Mayor square and nearby streets of Bunol, eastern Spain. This entry was posted in Spain on 2011/09/01 by Trailsurfer.